Lovely set of six Bordallo Pinheiro Side plates. Large Italian Mid Century Abstract Applied Design Green Vase Art Pottery Vintage. 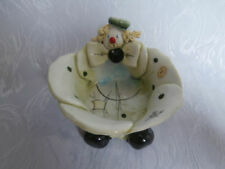 Condition is Used flaw in the rim as pictured is under the glaze Dispatched with eBay delivery – Shutl 2-3 days. A Michel Caugant Vintage French Ceramic Green Duck covered dish / tureen. Slight chip on table as shown in pictures. Dispatched with Royal Mail 2nd Class. 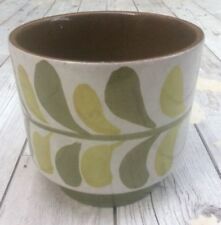 New listingVintage Retro Green/Brown Drip Glaze Medium Planter. A FAT LAVA, EARTHENWARE LAMB BASE. STUDIO POTTERY, VERY GROOVY FEATURE FOR ANY MID CENTURY LOVER. VERY HEAVY BASE COULD COPE WITH A LARGE LIGHT SHADE. FUNKY COLOR AND TEXTURE HAS SMALL WIRE HOLE BOTTOM AND TOP CORNER CORD. Stamped and numbered on the base. This is a super mid century modernist piece, decorated wonderfully with a modern abstract pattern. The glaze is is predominantly a light green colour but does have aspects of earthy browns and a light grey throughout. Here we have a lovely retro pottery lamp base. I imagine this is West German from it's style - but as there are no makers marks I can't confirm who it was made by. It is complete with it's original shade. Officially sanctioned by The Andy Warhol Foundation. Art No. 95352. NOTE - small chip in the top right hand corner. CARSTENS Ceramic West German #7444-25 Green 26cm Square Bottle Vase A Vintage pottery vase / jar with a squared body decorated in relief with geometric signs in squares. It has a handle giving it a bottle look. It is base stamped with the Carstens Tönnieshof mark with two "houses" and the C over T. It measures approx. 26cm high. The base is 11cm square. It is in very good condition with no chips, cracks or crazing. Dispatched with Hermes Tracked. HERE WE HAVE A 12 " BORDELLO PINHEIRO CABBAGE PLATE. A COUPLE OF FIRING FAULTS BUT NOTHING MAJOR. THE STAMP HAS FADED ON THE BACKS A BIT. 2 X VIETRI Art POTTERY GOBLETS, ITALY, Hand Painted AMALFI. 2 Beautiful, Hand painted goblets by VIETRI, Amalfi. Size, approx 5.5” tall. Both goblets in great condition with no crazing to the glazing. Good strong colours to the ABSTRACT/GEOMETRIC designs. Dispatched with Royal Mail 2nd Class. Gilt painted vase. 1960's / Mid CenturyGerman. Weight 723 grms. ask you to request a combined invoice from us. A large and gorgeous Bordallo Pinheiro Portuguese bowl decorated with textured maple leaves. In very good condition with just the beginnings of craquelure in places. Approx measurements: 28cm in diameter at rim 12cm high There is another Bordallo item listed. Please email for combined postage discount. Bitossi Large Lamp Base. Mid Century Pottery. Circumference (At widest Point): 65cm. Pair of attractive German pottery jug vases. Finished in a shiny black and green glaze. They are in good condition but do have a few scrapes and scratches to the glaze. THERE IS ALL OVER CLEAN CRAZING AS IS NORMAL AND THERE ARE A COUPLE OF THE TINY AND VERY MINOR FLAKES THAT OFTEN APPEAR ON THE RIM. THE PLATE IS SIGNED ON THE BACK FOR VILA CIARA WHICH IS IN SPAIN. 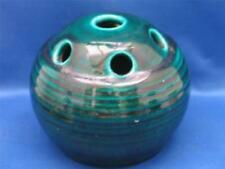 West German Scheurich Green Swirl Design Vase. Marked W. Germany Scheurich 291-38. Lovely West German decorative vase. West Germany. H B QUAREGNON DOG HANDLED, GREEN AND GOLD VASE. (13 INCHES / 33cm HIGH). A BEAUTIFUL HB QUERAGNON DOG HANDLED VASE. IN GREEN AND GOLD WITH A FLOWER AND BIRD PATTERN IN YELLOW, RED, BLUE, AND PURPLE. Painted to base (see picture 9). HAND-DECPRATED DEPICTING ANTIQUE SAILING VESSELS AND ANCHORS. ITALY c.1950s. HIGHLY GLAZED. LARGE CUP AND SAUCER. GREEN & BROWN. TOTAL WEIGHT 5.13 GRAMS. HEIGHT 0.75CM. A BEAUTIFUL TROYAN DRIP GLAZE JUG...LARGE...V.G.C. By Carstens of Tonnieshof, West Germany. Approx 12cm tall x 12cm dia. Vintage Retro Green/Brown Drip Glaze Medium Planter. Vintage Retro Green/Mustard Glazed Planter.